The University of Haripur (UoH), offers admissions in the following Postgraduate Academic Programs (M.Phil / M.S / M.Sc (Hons) and Ph.D) in Spring-2019. M.Phil/MS in Microbiology or in any other related field (Biological Sciences). M.Sc in Biochemistry / Microbiology / Biotechnology / Molecular Biology / Hematology / Chemical Pathology or equivalent, with B.Sc (MLT). BS in Computer Science / BS in Information Technology/ Bachelor of Computer Science / Master of Computer Science/ Master of Information Technology/ MSc (Computer Science) / Computer Engineering/ Bachelor of Science in Software Engineering/ Bachelor of Engineering in Information Technology / Bachelor of Engineering (Computer & Information System)/ BSc Computer System Engineering / BS (CS) or Computer Science Conversion Course 2 years Degree Program referred to BCS-3 years Degree Program- student will be required to complete the deficiency of difference of total earned credit hours and 130 credit hours. Minimum CGPA 2.5/4.0 in semester system or second division in annual system in BS/MA/MSc will be required. M.Phil / Master / MS (After 18 years of Education) or equivalent degree in Management Sciences. Master (16 years of education from any HEC recognized university) in the relevant field including; Forestry, Botany, Biotechnology, Chemistry, Biochemistry, Geology, Microbiology, Medical Lab Technology, Zoology, Journalism, Economics, Law, Education, Management Sciences, Psychology, Medical/Clinical Sciences and Engineering Sciences. M.Sc in Forestry & / or Wildlife Management. OR B.S in Forestry & / or Wildlife Management. Note: Classes for above all Post-Graduate Degree programs may be arranged / adjusted in morning / afternoon / weekend days, as determined by the Department concerned. For admission in any of the above announced programs, the candidate must fulfill the following admission requirements. For M.S/M.Phil Admissions: The candidate must have passed the Bachelor (16 years education or 4 years after FA/F.Sc) examination or an equivalent examination, with at least 50% marks (under annual system) or CGPA of 2.50/4.00 (under semester system) from an HEC recognized institution, in a field of study relevant to the subject a candidate desires to take up. For Ph.D Admissions: The candidate must have passed the Master (18 years education) examination or an equivalent examination, with at least 60% marks (under annual system) or CGPA of 3.00/4.00 (under semester system) from an HEC recognized institution, in a field of study relevant to the subject a candidate desires to take up. Admission Test: All eligible candidates shall have to qualify (70% marks for Ph.D and 50 % for M.S/M.Phil) the admission test conducted by the University of Haripur (Course outlines, Sample Papers and instructions for candidates can be downloaded from the University’s website (link: www.uoh.edu.pk) OR submit a valid qualified (60% marks for Ph.D and 50 % for M.S/M.Phil) result card of equivalent test conducted by ETC/HEC or NTS. NOC and Leave Certificate: In service candidates must apply for admission through proper channel and successful candidates will have to submit NOC and leave certificate, if required, initially for two semesters (except those University employees, who are not sponsored by HEC scholarship program or any other agency which requires leave as a precondition). Last date for submission of Application Form 1st February 2019. 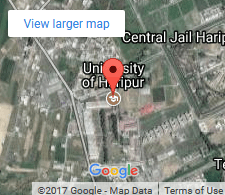 Venue & Time: The University of Haripur, 10.00am. The University reserves the right to drop any program, if it decides to do so, on any ground as determined by the University. Prospectus can be obtained in person from office of the Director Advance Studies and Research Board (ASRB) The University of Haripur on showing the online receipt of application processing fee. Prospectus can also be downloaded from the University’s website (link: www.uoh.edu.pk). Application Form:- Application forms can be filled on-line only, available at (link: www.uoh.edu.pk/how-to-apply-ms) once application processing fee has been submitted. Printed copy of the online submitted application form, online application processing fee receipt (original) and attested photo copies of Degrees/ Certificates, DMCs, 04 (four) recent passport size photographs, CNIC and Domicile must reach the office of the Director ASRB, at the below given address on or before 1st February, 2019.